Hello, world! Welcome to Crash Course Computer Science! 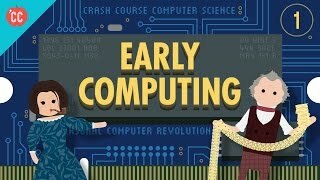 So today, weâre going to take a look at computingâs origins, because even though our digital computers are relatively new, the need for computation is not. Since the start of civilization itself, humans have had an increasing need for special devices to help manage laborious tasks, and as the scale of society continued to grow, these computational devices began to play a crucial role in amplifying our mental abilities. From the abacus and astrolabe to the difference engine and tabulating machine, weâve come a long way to satisfying this increasing need, and in the process completely transformed commerce, government, and daily life.